Help themselves to a good drink. Harvest time, nevertheless, was one of the most joyful times of the year for the peasants. With it were connected many customs going back to the distant past. Before starting to gather the crops, for instance, the harvesters would roll on the ground hoping that the earth might grant them the strength needed in the work. According to another explanation, it was believed that the sheaves would "roll" into the barns in great numbers. When the harvest was over, a shock of unreaped wheat, tied with a ribbon or a straw binder, was left at the end of the field. This boroda or "beard," as it was called, was originally an offering to the pagan field gods. Later the custom was aimed at "keeping the mice in the field," i.e., preventing them from "visiting" the barns. In another explanation, the boroda was to provide a hiding place for quails. The ears of grain gathered last were used by the peasants for making a tidy sheaf which, decorated with field flowers, was ceremoniously brought to the household. This sheaf (called dido or diduch -- grandfather) remained unthreshed, and during Christmas it was held in an honorable place at the Christmas Eve table. Since it was believed to have magic power, ears from the sheaf were woven into the wedding wreaths, put into the beds of women giving birth to their first child, and in curing diseases. The supposed procreative power of the sheaf led the peasants to place ears from it under hens in hopes of getting more eggs from them, and to put grains from it into the first seed, and so on. With the harvesting finished, the harvesters would make a ceremonial wreath and, singing cheerful songs of the season, bring it to their master or the manager. After binding the wreath with a special ribbon, the master or his deputy would invite the harvesters for a feast (obzinky oldomas). Cekaj nja, mamocko, domu na subotu. Ne tak na subotu, jak na tu nedilju. Rychtoj mi, mamocko, kosuljenku bilu . Bo ja z zalu umru, budes banuvaty. Umru v Madjarscyni z tjazkoji roboty. Zacnu v ponedilok, tjahnu do suboty. Now we have finished the Hungarian job. Or else I'll die from woe, and you'll be sad. After World War I the obzinky customs became largely defunct. However, after World War II they were revived in the newly-founded collective farms both in Soviet Transcarpathia (Subcarpathian Rus') and in Czechoslovakia's Presov region. At present, when the harvest is over, the harvesters will ceremoniously bring an obzinky wreath to the head of the kolkhoz (or cooperative farm in Slovakia), singing humorous both traditional and contemporary. The obzinky feast then takes place in a local tavern or, in some places, in a local cultural center. Pravo nevelycke Lem korytce vivsa. The girls will beat you. We want only a trough of oats. If you don't give it to us. Being thus duly "warned." the Andrew in question would bring the girls the "offering" they asked for: oats, eggs, flour, and other foodstuffs. The girls would then go to the tavern and exchange the oats for brandy, and use the rest of the food for a feast in one of the village houses. (Later on they would be joined by the boys and a musician, and of course the revels would become more joyous.) The girl's party would include also some jocular palm-reading and "magic" rites aimed at finding out which of the girls would marry in the course of the year. These rites had various forms: all the girls went to the stream and each one gathered a number of small stones. These were then counted at the party: an even number meant marriage, an odd number meant further waiting for the bridegroom. In another custom, the girls would make small flour pellets, lay them next to each other, and let in a rooster or a dog. The girl whose pellet was eaten first was "sure" to marry first as well. Given thus the "sign" of the upcoming marriage, the girl was obviously eager to know who her husband would be. She "found it out" by counting the ninth post from the left in the fence. If the post was upright and covered with bark, the bridegroom would be handsome and rich. If there was no bark an the post, the husband would be poor. If the post was crooked, the husband would be a hunchback. If there were knots in the pole, the husband would be a widower with children. Later the girls invented a new custom: slips of paper with the names of various boys would be added to the filling of pirohy (pastries filled with jam or cheese). When the girl then received a pirohy with a name of one of the boys, it was believed that she would marry him. She would then use a pair of undershorts to "harrow" the patch of land she had sown with flax. At night she would lay the undershorts under her head. The boy she dreamed about in her sleep was to become her husband. There is no doubt that this "magic" technique of prediction was highly successful, for the "dream boy" would most likely be the same who figured most prominently in her daytime thoughts about the prospective bridegroom. 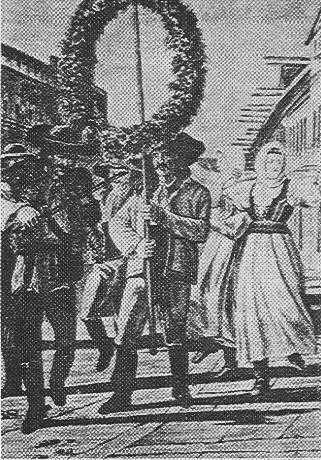 Carpatho-Rusyns with a harvest wreath in a procession on the streets of Presov. From a lithograph, dated 1841.